If you are in need of self storage in the Northampton area where do you go? For people needing storage in Northampton there are a couple of excellent choices when it comes to secure facilities nearby. Householders and renters living in the central part of town have the convenient Lok’nStore storage centre at Grafton Street Industrial Estate. This storage centre is located in the middle of town, making it a superb place for anyone in the NN1, NN2, NN4, NN5, NN6, NN7, NN11, NN12, NN13 postcodes. You will not be able to miss this big orange building as you travel into Northampton centre. For those on the eastern side of Northampton there is a large storage facility at Riverside Retail Park serving householders in the NN3, NN6, NN7 postcodes. This storage centre is on a popular retail park with a number of other big brands present. 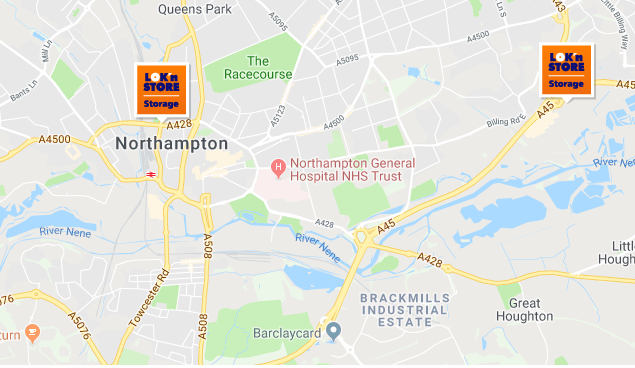 The Lok’nStore Northampton self storage centres have easy access during open hours and ample free parking for customers. They also sell cardboard boxes and all manner of packaging materials for moving home or putting items into storage.